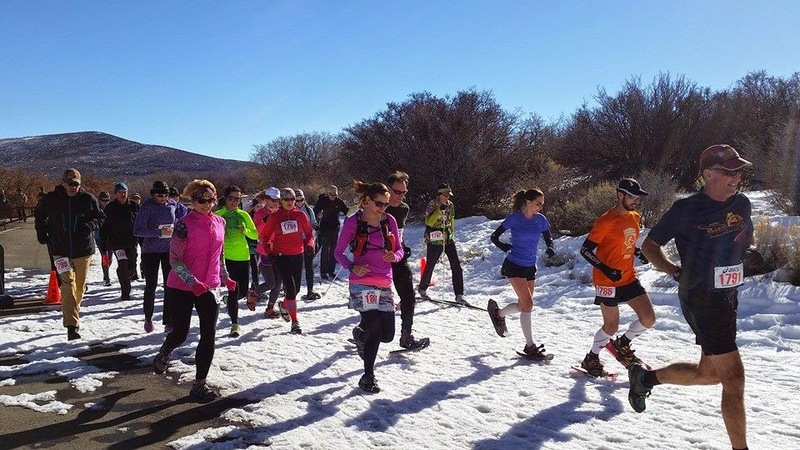 On normal years, the Black Canyon Winter Rim Romp offers snowshoe and cross country skiing categories in 8K and 16K distances. Well this was not a normal year. We had WEEKS of 50 degree weather (in January and February!! 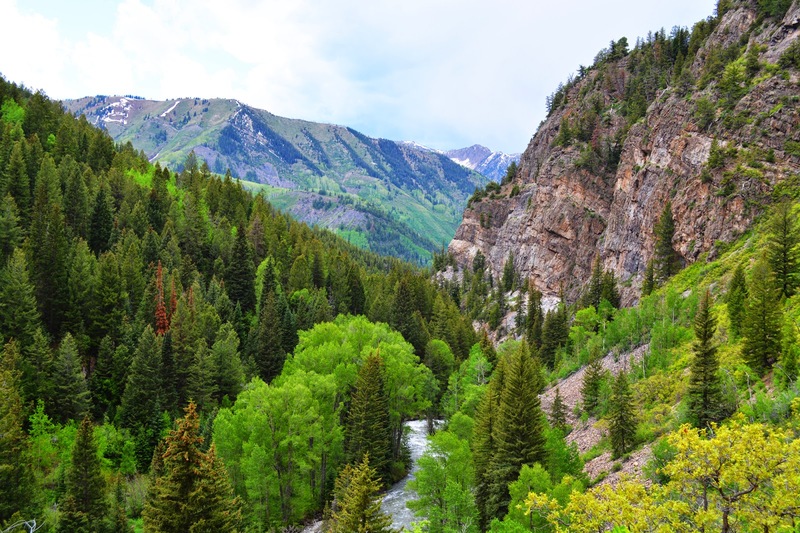 ), which left the rim of the Black Canyon with not-so-much snow, despite it's 8000' altitude. I signed up in January to do the 8K snowshoe race - but after seeing some photo's on facebook a few days prior to race day, I decided to just run it in Yak Track's and not even worry about the snowshoes. There were sections of the course that were completely bare with no snow - so this worked out nicely. Several people decided to do this as well, so an entirely new "running" category was added to the race. They also changed up the distances - having a 5K and 10K option instead of the typical 8K/16K (although a few brave souls did do the entire 16K). In January I had talked with my friend Rochelle about doing this and so we both signed up. Then Rochelle managed to recruit a bunch more people - so we ended up with a giant SUV full of Grand Junction folks carpooling down to Montrose for the event! 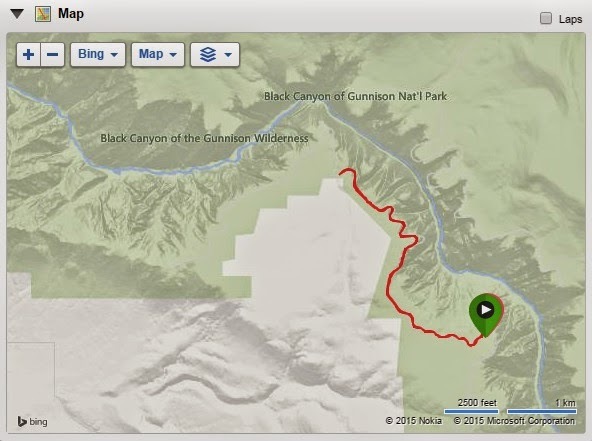 We made it to the Black Canyon with about 15-20 minutes before the start of the race, so I made a quick trip to the rest room, picked up my packet, and debated what I was going to wear before heading to the start line. I chatted with a few old friends from Montrose before starting the race! 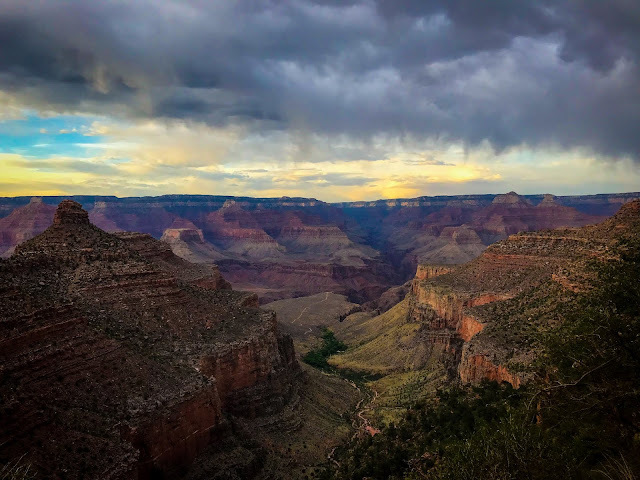 My original plan was to take the whole race easy, as I had my last long run before the Phoenix Marathon scheduled for the next day. Well despite running the first mile or so easy, my competitive juices started flowing and I picked it up a little from thereon out. I had a light long sleeved shirt on at the beginning which I had to take off fairly quickly - leaving me running in a tank top (at the "Winter" rim romp)! The weather was seriously gorgeous! The course is pretty rolling with a long gentle downhill on the way out - that ends up being a very long uphill on the way back (feels never ending while you're on it), but it was a nice challenge and I just kept pushing through. 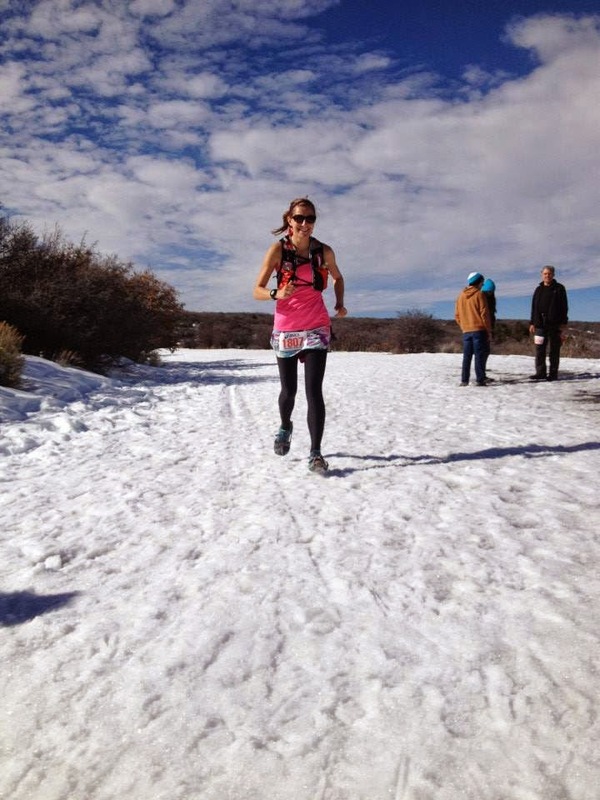 The terrain was actually kind of rough to run in - the snow was packed down, but not even at all, so it was a workout. I tried to run on the pavement as much as I could whenever there were melted sections. Finally with about 1/2 mile to go it's downhill to the finish! I picked up my pace as best as I could and finished in 1:05:25 - which to my surprise was good enough for 1st place female (there was one women in front of me on snowshoes - but they ended up doing the snowshoe race as a separate category - good thing too because she was SPEEDY!). Weather: Beautiful - 50 and sunny! Post-race! We wore pink for Valentines Day! My major award for being 1st Place Female! 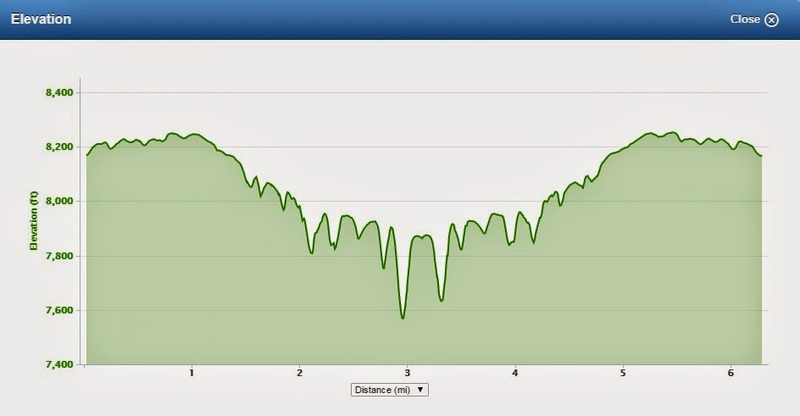 Elevation Profile - I think this is accurate other than the huge dips - that's where my Garmin must've thought I was falling off the edge of the canyon!). Ever since I ran the Winter Sun 10K last December and destroyed my previous 10K PR, I've been wanting to run a 5K again. It's been driving me CRAZY that my 10K PR average pace (7:29 per mile) was faster than my 5K PR average pace (7:40 per mile). 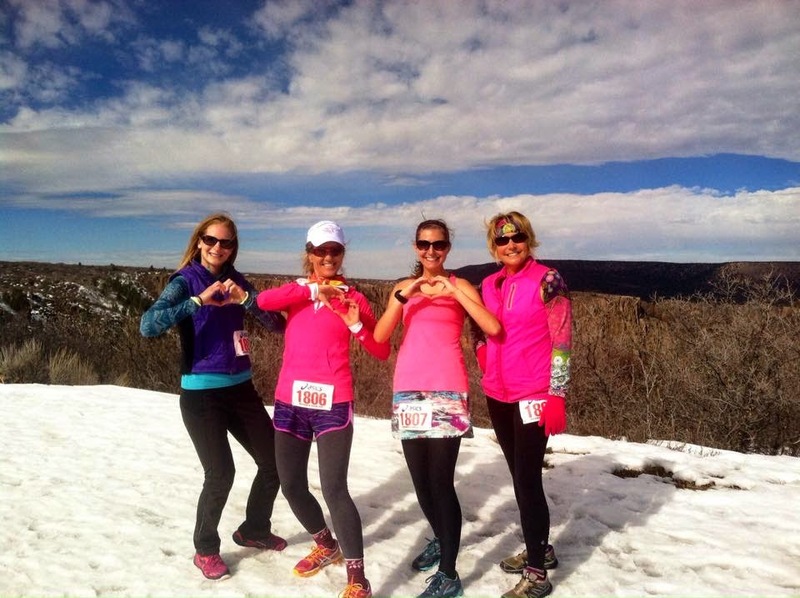 So, I decided to sign up for the Fruita Sweetheart 5K. This race has a 5K and 10K option. Two years ago, I ran the 10K as my first "official" 10K, but skipped it last year, as it was the same day as the Rim Romp. I showed up to the start line fairly early so I could get a nice warm-up in prior to the race. I hadn't ran the day before - which I usually don't like to do - but I was feeling really worn out and not recovered after my marathon training "peak week" (my highest mileage week in my current training cycle - which was 63 miles and included a 20 miler, a pretty intense speedwork session and 10 mile tempo) - so I had decided to take Friday off. I warmed up for about 25 minutes before lining up at the start. Now I'm not sure if I missed some directions because I was warming up, or if they just didn't make any announcements, because without a single word - they just fired the starting horn - and we were off - just like that. My goal for this race was to place in my age group. Looking at last years results I figured it was probably do-able - especially since this race had the 10K option too - I think typically when there's two options like that, most of the serious runners will do the longer distance (also helping my case was that Moab's Red Hot 33K/55K was also this same day - so I'm sure people were at that one too!). I started out pretty fast - my race strategy for today was to "go out as fast as I possibly could and hang on for dear life." It seemed to work pretty well :). (In all honesty though, I've been getting advice from other runners lately and apparently you don't want to negative split a 5K - that just means you had more left in you and you should have ran faster!). About 1/4 mile into the race I got to experience some excitement! There was a guy outside his house with his dog - who apparently got loose and started chasing the runners. It was coming up to me and the guy yelled "STOP RUNNING, HE'S GOING TO BITE YOU." Me being all gun-ho about trying to PR and place yelled back, "NO - I'M IN A RACE!!!" Haha - probably would've regretted saying that if I had gotten bit - but thankfully I didn't. The dog kept on running and the owner kept running after him - it was kind of funny. Eventually I passed the guy and his dog, so not sure what happened, but hopefully no one got bit! I kept my pace up as much as I could and ran the first mile in 6:51! Now if only I could keep that up for 2 more miles! At around the half-way mark there is an aid station as the course turns onto the Big Salt Wash Trail. This was when a course volunteer yelled at me, "First Female!" - which was kind of exciting (and good to know - I hadn't been sure whether or not there were any other women in front of me or not). This kept me motivated to keep my pace up and I finished mile 2 in 6:58. Now the tricky part - maintaining that pace and/or my lead for ANOTHER mile. I knew I was getting extremely tired - I have only ever ran a sub-7:00 mile one time prior to this race. I did the best I could, but I could feel myself slowing a bit. I also wasn't sure if there was anyone behind me - but I also didn't want to look either. So I just kept at it and finished mile 3 in 7:23. Only .1 to go! 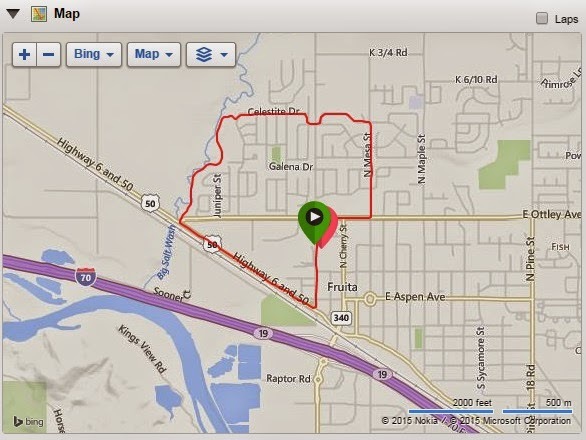 Well kind of - my Garmin was (as usual) showing the distance as farther than the course had it. But I kept pushing and finally the finish line was in sight! I finished in 22:41 - a PR by over 1 minute and good enough for first place female!!! 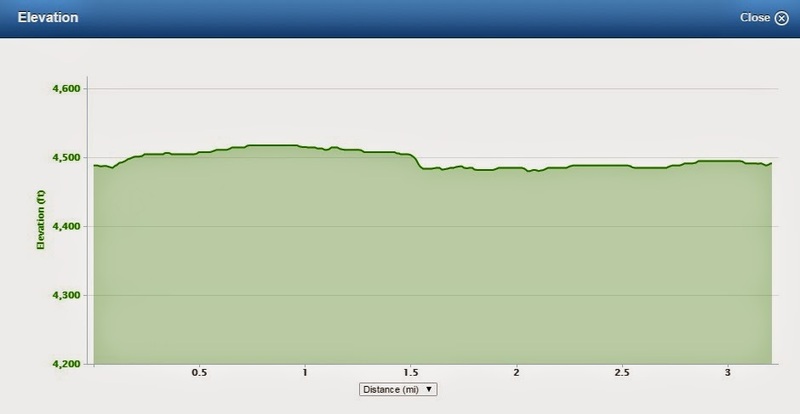 Elevation Profile - relatively flat!